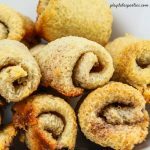 Make your busy weekend breakfast special with easy mini cinnamon roll bites. Made with sandwich bread, there is no yeast or rising time required! Who doesn’t love cinnamon rolls? The combination of warm dough, tasty cinnamon, and sweet icing on top is just too good to pass up sometimes. But, I’ll be honest. I don’t want to fuss with making a homemade dough, waiting for it to rise, rolling everything out, and then letting it bake. Our mornings are just too busy for that. Which is why I was so excited to see this recipe from Circle B Kitchen. Itty bitty cinnamon rolls, using sandwich bread instead of homemade dough? Sounds like a winner to me! 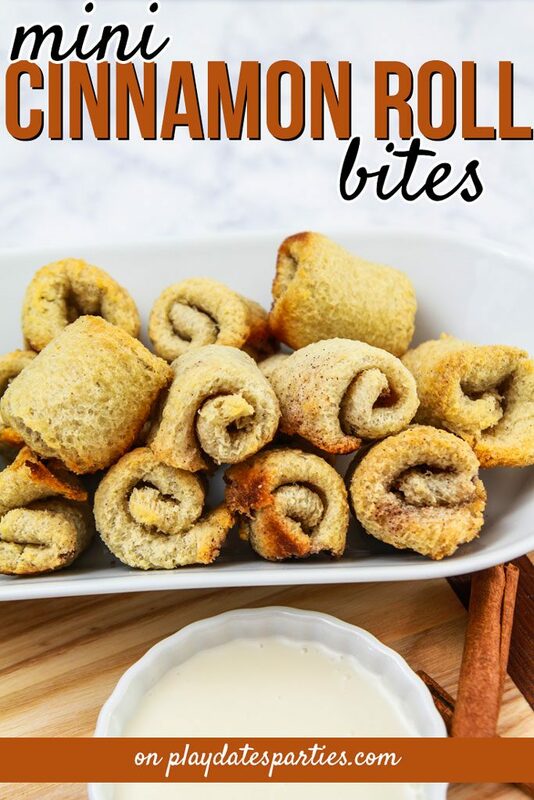 So, I whipped up some of these fun mini cinnamon roll bites, and I can tell you they were a HUGE hit. Prepare a mini muffin tin by buttering each well. Preheat your oven to 375 degrees. In a small bowl, stir together cinnamon and sugar, and set aside. Stack a few pieces of sandwich bread together, and use a bread knife to remove the crusts. Repeat until all the bread crusts are removed. With a rolling pin, flatten out each slice of bread. Brush both sides of the flattened bread slices with melted butter. Sprinkle the cinnamon sugar mixture on one side of the bread, and then fold the edges of the bread into thirds, much like folding paper to put in an envelope. This will create a rectangular shape with a pocket of cinnamon sugar in the center. Use your fingers to seal the edges together. Gently roll the bread pocket along the short side to create a mini cinnamon roll. Place in the prepare mini muffin tin. Repeat Steps 5 through 8 until the bread slices are gone. Bake the mini cinnamon rolls for 15 to 20 minutes, until the edges are just turning golden brown. Combine the powdered sugar and 1 to 2 tablespoons of milk, Stir until well combined. Add vanilla extract and stir again. Confused at all? Watch the video to see how to make them for yourself. Make the filling process go faster by laying out several slices of bread at once. When rolling out the bread slices, make sure you get them as thin and smushed down as possible. Keep your bread crusts to make bread crumbs or to use in another recipe. As much as I prefer wheat bread, I found that it doesn't get flat enough for this recipe. You can also sprinkle cinnamon sugar on top of the mini cinnamon rolls before baking for a little extra sweetness. When making the icing, start with just a little bit of milk, and add more if it is too stiff. You want the icing to be thin enough for dipping the cinnamon rolls, instead of thick like a traditional glaze. These can be made in advance and frozen: Heat in the microwave at 20% power and 30 second increments until just barely thawed. Then crisp up in the oven at 300F for 5-10 minutes. Icing is best made right before serving. As much as I prefer wheat bread, I found that it doesn’t get flat enough for this recipe. The icing is best made right before serving. 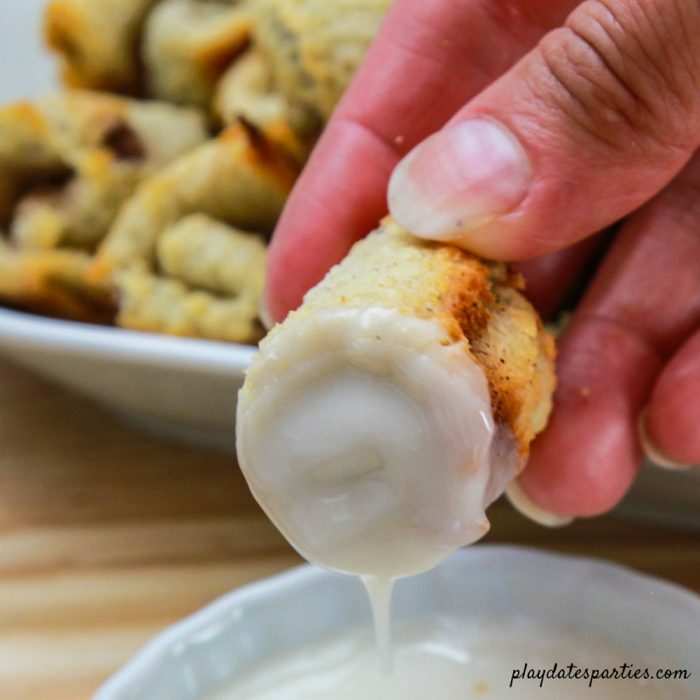 What would you make these mini cinnamon roll bites for? Will anyone else in your family get to have any when you make them? Popped in from SITS! Those look delicious! these look so yummy! I want to make them tonight. I will have to see if I have the ingredients. thanks for sharing. I'm a new follower! Ooh, cinammon and sugar, my favourite combination! These look delicious, they'd be gone just as quickly in my house too! 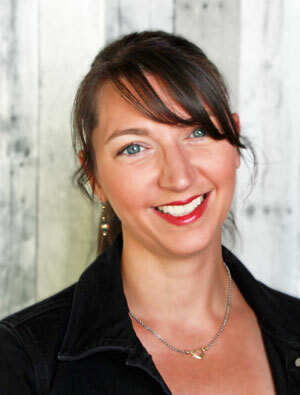 @AndreaLeigh – Definitely try them, and let me know if you do! @Kelsey – They were very tasty, especially with the glaze…mmmmm! @Kathryn Michelle – One of the best things about this recipe is that you probably do have most of the ingredients on hand. Happy baking! @Kathryn – Cinnamon and sugar is such a classic and tasty combination…it's no wonder you find it in almost every pastry recipe! 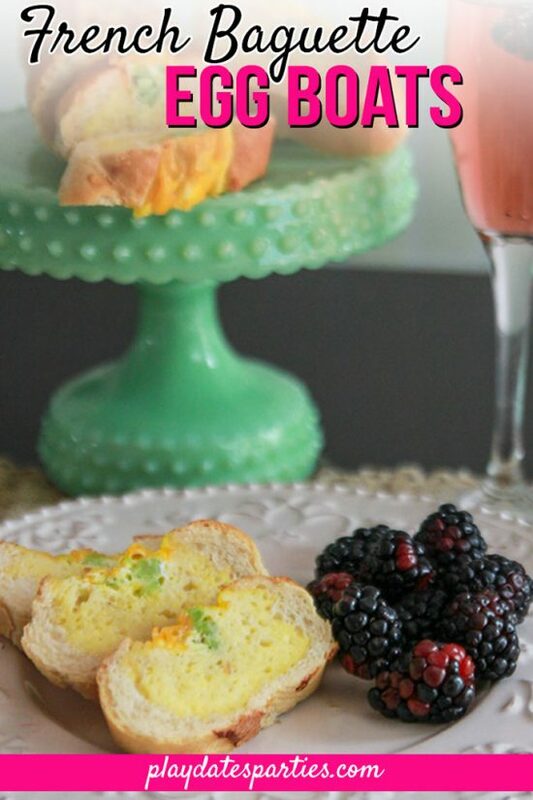 @Ladybehindthecurtain – I wish I could take credit for the recipe, but I can't! If I get the chance, I'll check your linky out! Those look so good! Off to check them out. Yum! Can’t wait to try these! I’ll once again reach cool Mom status 🙂 Thanks for sharing with us at Snickerdoodle Sunday! Pinned, tweeted and fb shared 🙂 Have a great week! I really couldn’t make them fast enough. Let me know if you try them! These look awesome! Pinning. Visiting from Create It Thursday. wow YUM! So delish!! I stumbled these! Mmm these look delicious! My kiddos would love them! Ohhhh! This is such a lovely idea!!! Pinned & shared!! What a wonderfully simple idea! Thanks for sharing at the What’s for Dinner party! We used to eat cinnamon toast as kids. We just toasted the bread and put the same ingredients on top. It was always yummy! Oh I totally forgot about these; we used to make such a similar treat and we all just LOVED them; though didn’t think to serve with dipping sauce like that. Yum! Pinned. What a smart idea. I’d never have thought of making them this way. Oh, YUM! I can convert this to gluten free too! As I am celiac. Thank you! That looks delicious. I made homemade cinnamon rolls for New Years Day but they were so much work that I don’t anticipate making them again. It’s nice to know there are easier options out there. Ooohh, these look so yummy! 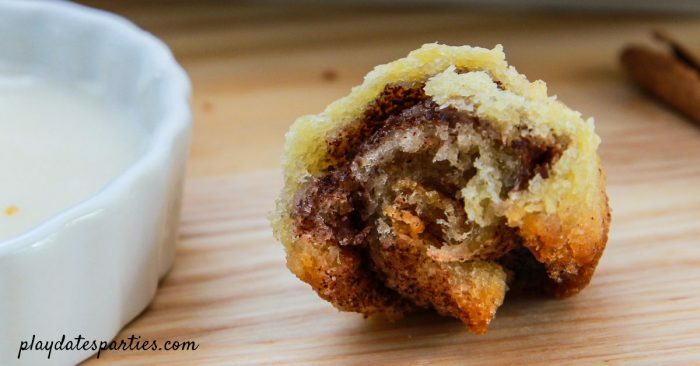 I love cinnamon rolls, and this is a great idea! Thanks for sharing on Foodie Friday! My son will love these. Thank you for sharing the recipe! Wow! Who would guess you use bread? Looks yummy! Thanks for sharing with SYC. What a fantastic idea! This is my kind of making cinnamon rolls. Thank you for sharing at Foodie Friday. Cinnamon is great! These look lovely (and your photographs do them justice). Mind you, I’d probably not do the icing dip, but the rolls themselves… yep, yes I’d do these!